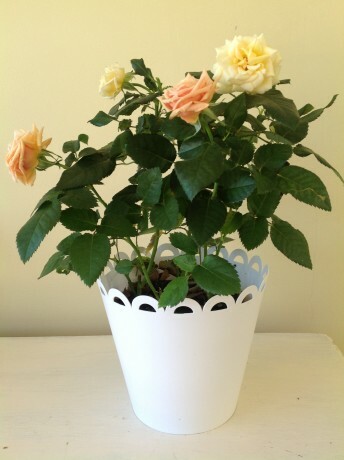 The plant pot wrap is a cleverly designed plastic cover which will quickly and easily disguise the plain pots that come when we buy our potted plants at the garden centre. These reusable sturdy white covers simply wrap around the ordinary plant pots, the pretty lace-edged finish enhancing their appearance. They can be used indoors and outdoors. Use them around different pots of herbs to display on the windowsill in the kitchen, or in the conservatory covering a plant pot. Easily assembled by securing the ends together in the grooves provided. Folds flat for storage. Purchased as a set, comprising of 1 large and 1 small plant pot wrap. A great gift idea for the green fingered, or when given together with a pot plant as a gift.